Forage caps were the most popular headgear worn by the Union army, particularly in the eastern theater of operations. The forage cap was adopted during a time when the standard army headgear was the model 1851 cap, a shako used for both dress and fatique. Photographs of troops in the field showed that the shako did not hold up under field conditions. 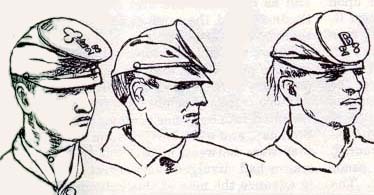 The forage cap was introduced just in time to become the signature headgear of the Civil War soldier. The visor can be flat or sloping. Quartermaster correspondence indicates that the earliest pattern of the model 1858 was stipulated to have a sloping visor. Forage caps with an exaggerated posterior height and sloping visors are commonly called McDowell style forage caps. Some would apply the term narrowly to privately purchased caps with particularly exaggerated features. The original 1858 model had a welt around the crown in the branch color. In 1861 this was discontinued in favor of a dark blue welt the same for all branches and the same color as the rest of the cap. The caps were manufactured in six sizes. The inside of the cap has a outer lining of black Silesia cloth and a inner buckram reinforcing layer around the base. Lastly a leather sweatband ran around the inside base. The front of the cap had a leather chin strap held on by two small eagle buttons and joined by two leather slides and a brass buckle. The top of the cap had a cardboard stiffener. The insignia worn on forage caps varied from none at all to an extensive set of army corps badges, branch insignia, regimental numbers and company letters. They might be placed on the front or the top of the cap. Regulations called for officers to wear the badge of their corps (branch insignia) and enlisted the letter of their company on the front of the cap. In practice these regulations were not honored and many more insignia worn.